Greg Gompf is shown during last Friday’s D-I state championship game in Canton. CANTON — Morrow County was represented during last weekend’s state championship football games played here. 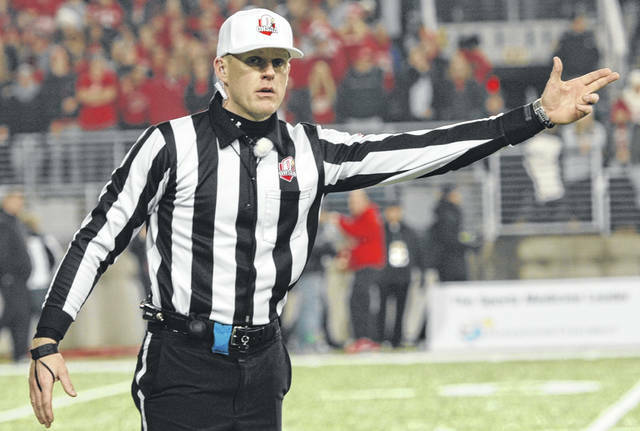 Greg Gompf was chosen to be part of the officiating crew for the Division I state title contest between Lakewood St. Edward and Cincinnati Colerain on Friday night. “It was a humbling experience and an honor to be chosen one of the best 7 referees out of 3,800 officials in the state of Ohio,” he said. St. Edward prevailed 24-10 in one of 7 divisional state championship games played at Tom Benson Hall of Fame Stadium. Gompf has been officiating high school football for 11 years and also works college football in the North Coast Athletic Conference. Yet his journey began quite by accident. The OHSAA has tried, much like the NCAA and the NFL, to make the game safer. Officials must learn the rules and are graded by the OHSAA. The top ones are chosen to do post-season games. Gompf has worked 7 straight post-seasons, including last year’s Division IV state semi-final game between Shelby and Steubenville. “We work with the same crew throughout the regular season. Our goal is to monitor the flow of the game and try not to be too nit-picky,” he said. Giving up weekends during the fall is a sacrifice for officials. Gompf is a 2003 graduate of Mount Gilead High School and a 2007 graduate of the University of Toledo where he played baseball for the Rockets. He is married to Morgan, a first-grade teacher at Marion Pleasant, and is the son of Gene and LeAnne Gompf of Cardington.